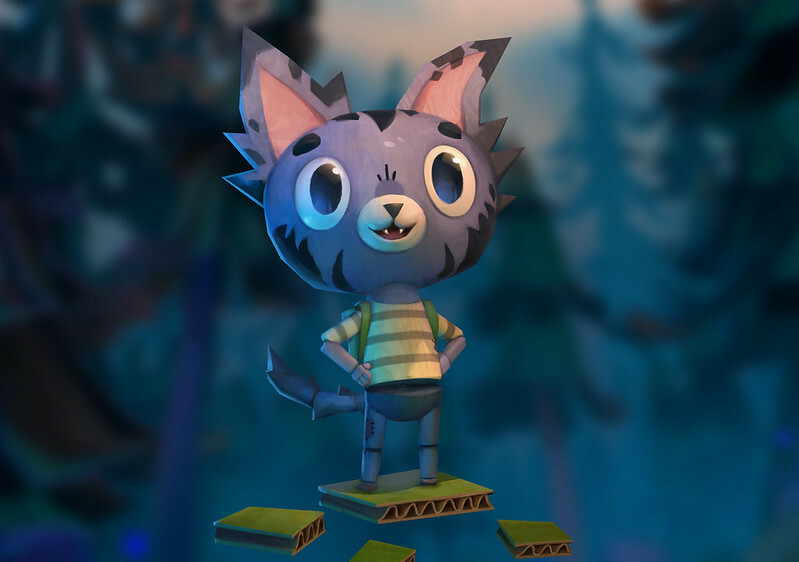 In our new VR adventure you get to experience that precise moment when you meet the young cat boy Louis! You’re right there in his world, in the shape of the Ghost Giant. You’re real, big as a hill and scary as thunder. You lean closer and poke him, he screams and runs away to hide behind a rock. From there on it’s up to you to figure out how to earn his trust. Our VFX Artist André Jönsson put a lot of effort into making effects which make the connection between you and Louis feel both more real and magical. The world has a very crafted look and feel to it, and that was always a common denominator throughout the development of the style. There are lumps of papier-mâché for foliage and painted cardboard for buildings — with thumbtacks, nails and tape keeping it all together. The style also helped to optimize the game since, instead of making high polygon models with fancy materials, our Environment Artist — Leo Brynielsson – just focused on painting yummy textures with a handmade look. Which, as a bonus, made Patrik Häggblad (the programmer responsible for making our game run smoothly) very happy. Thanks to our Programmers, Kristian Dam and Katharina Wunder, the Ghost Giant can lift off walls, roofs or rotate whole houses, take a huge crane and use it as a fishing rod or grab a big rock and throw it over the woods. There’s also the tactileness of leaning closer to listen in on the conversations going on in town or putting silly hats on people (thanks to our Lead Programmer and Producer, Sebastian Strand. Time well spent on that one). We wanted to channel that feeling of having created your own diorama world and exploring it as a child, the tiny world coming alive as you play. The project’s Concept Artist, Stina Rahm, is especially great at drawing adorable animals and we wanted to encourage her to go nuts with animal designs. This added extra flavor to the characters. Monsieur Tulipe — the town’s florist deer — nibbles on his own flowers when nobody’s looking and Monsieur Bonbon, a grumpy lion, is forced to follow in his parents’ hoovesteps and sell vegetables. Going for anthropomorphic character designs was also a great way to find an accessible style with nice silhouettes and clear features that make them easy to read, even when they’re so tiny. It’s also cute and we like animals. Back when the first prototype was made by a small team lead by Zoink CEO Klaus Lyngeled, the story took place in an American, jazzy small town. However, when Ghost Giant’s writer Sara B. Elfgren first saw the demo and its pastel color scheme her mind went to The Umbrellas of Cherbourg (1964). She suggested writing the story and designing the art like it was set in a fictional France in the sixties. I put together a mood board based on pictures of French picturesque small towns, clothes and old cars from the 50s and 60s and it all ended up somehow fitting the mood and atmosphere of the story better. It made us try something that was quite different to what we’d done before in our other games, with bored beatnik cool cats instead of jockey school bullies and lush countryside where there previously had been steamy, rowdy streets. Telling a story in this medium and small scale proved challenging at first but when we began thinking of the game as a cozy theater things quickly fell into place. When something important is going on in the scene, we dim the lights and direct a spotlight at the action. We also turn down the background noise and play different music. Last but not least, the expressive animations by Stefan Markan, Mathias Lorensson and Willand Sköld Ringborg and Sound Design by Marcus Klang did wonders to the storytelling as well. Tomorrow, April 16, we welcome you to Sancourt! The team has worked long and hard on the project and we’ve all put a piece of our hearts into it. We hope you’ll enjoy your visit, make some new friends and memories. Just remember that even though you’re the big, tough giant in this story, you’re here because Louis needs you. Only through working together as friends will you be able to learn more about Louis and uncover what means to be a giant ghost.